Have you got any plan on spending this winter with your kids? Why don’t you take them out for snowshoeing? It’s easy and doesn’t cost too much money. But the fun and the excitement of the activity is totally worth it. You’ll get to strengthen your bonds with your kids by walking down the trails for a few hours. And your children will love you more because you’re actually being a part of their life. Have I got you interested already? We sure do hope so. 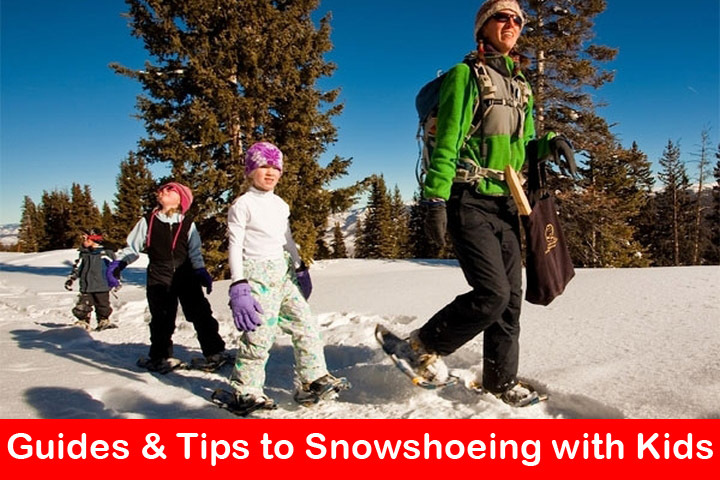 We’re going to walk you through every thing you need to start snowshoeing with your kids. We’ll cover the current top gears, what they need to wear, as well as a few tips to make the walk more exciting. Your children aren’t very active and outdoorsy type? No worries! Once they get to experience snowshoeing, they’ll ask you for more. 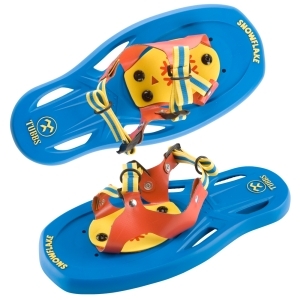 Chinook Trekker snowshoes come in both kid and adult sizes. The smallest size, 19-inch, is perfect for young children with recommended load ranging from 60-90 pounds. For bigger and older kids, you can opt for the 22-inch version. It can take in maximum load of 130 pounds. Sporting easy to set bindings, young kids shouldn’t have much trouble putting these snowshoes on and off. The dual straps go over the forefoot and the arch, secured with ratchet locking system. As for the heel strap, it comes with quick release buckle. 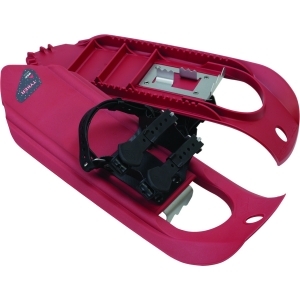 The decking on Chinook Trekker snowshoes is constructed entirely of plastic. So, expect to hear some noise when your kid walks on trail with them. Rest assured, it’s quite sturdy and UV resistant too. The frames and underfoot crampons are made of heavy-duty aluminum. It maintains the weight down while helping with the overall durability. Your kid may want to practice wearing them at home before hitting the trailhead. If that’s the case, remember to always put them on outside on soft ground. If you want something from a more respectable brand, MSR is your best bet. In addition to many well performing adult winter hiking gears, the company apparently also manufactures kid-sized snowshoes. MSR Youth Tyker has all that it takes to keep your little explorer secured and comfortable at the same time while wandering off the snow covered trails. Measuring in at 6.5 x 17-inch, these snowshoes are designed to promote natural strides for kids. Your kid will be able to walk normally as if he/she’s not wearing any snowshoe. The bindings on MSR Youth Tyker feature a fastening mechanism similar to that of leather watches. They’re simple enough for kids and can be set effortlessly, even without taking off those insulated mittens. They accommodate kids’ shoe size of 7.5-13.5 (1-4.5 adult size). 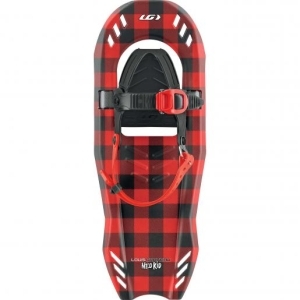 As for the traction system, you can relax because these snowshoes actually grip to hard pack. 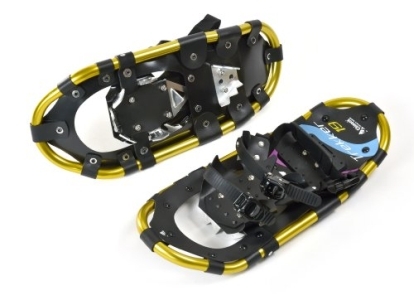 Not only are they equipped with steel instep crampons, but the frame itself has a toothy structure underneath, providing additional traction when traversing. MSR really overdoes it with these kid snowshoes. Lucky Bums Youth snowshoes are more than just well performing. They’re adorable too. Every kid must love their minimalist design combined with striking colored frames. The single strap bindings with ratchet-style buckle design might be a bit too complicated for younger kids but they do ensure the kids’ feet stay intact with the snowshoes. They’re available in three different sizes i.e. 14-inch, 19-inch, and 22-inch with the length remaining the same, which is about 7-inch. The medium sized version is able to stay afloat on fresh snow with maximum weight of 90-pound while the biggest one can stand a load of 120-pound tops. As far as the traction is concerned, Lucky Bums Youth snowshoes are inferior to MSR Tyker. Still, they do sport a grippy toe crampon and solid heel crampon that does a fine job on downhill trip. The decking is connected to a fixed hinge that keeps the snowshoes close to kid’s feet as they step. This helps with overall efficiency in moving, allowing your kid to move more easily and faster. 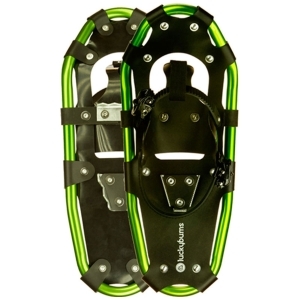 Overall, these are good snowshoes for kids and they come with limited lifetime warranty too. Even more striking than Lucky Bums Youth are Louis Garneau HG Neo Kid II snowshoes. They come in nine different color patterns; from the daring checkered red and black to a fun looking colorful rainbow. If you have a hard time encouraging your children to play outside in winter, these snowshoes might give you a hand. Anyway, the entire body of these snowshoes is made of molded plastic. You won’t find that good looking aluminum frame on this one. The only part that’s made of metal on these snowshoes is the toe crampon. To provide additional traction on varying terrain, a V-shaped plastic toothy structure is molded underneath the decking. Louis Garneau HG Neo Kid II snowshoes come in one size option only i.e. 6 x 16-inch. They are rated for a total load of 30-80 pounds; anymore than that, they’ll be less efficient and your kid will sink a lot into the snow. Since the metal part is kept to minimum, these snowshoes are incredibly lightweight. That would make them perfect for kids in 3-10 year old age group. Now if you’re concerned with the fact that it’s largely made of plastic, don’t be. These snowshoes are pretty rugged. The polymer material used to build them is not of cheap one. Of all the kid snowshoes we talked about so far, Tubbs Snowflake is the simplest one. It’s more like a toy than a functional snowshoe. As plain as it looks, this little guy can still hold up a few pounds. The manufacturer claims that it works best for 3-6 year old kid. Well, we’d say they’re perfect for 2-4 year old kid. Kids older than the said age group deserve better snowshoes; ones that have practical traction systems and help them move more efficiently on winter trails. Still, Tubbs Snowflake can do a good job introducing your little one to mild winter trekking. They’re colorful too and come with a bunch of stickers. Your kids can have fun decorating their snowshoes before wearing them for fun outing with you on sunny winter days. There are a few things you need to look out when you’re buying kids snowshoes: fittings, ease of use and comfort, size, and traction. Fittings: Not all snowshoe bindings can accommodate all children foot sizes. Some are made for smaller group age with smaller foot size while several others may support bigger foot size. 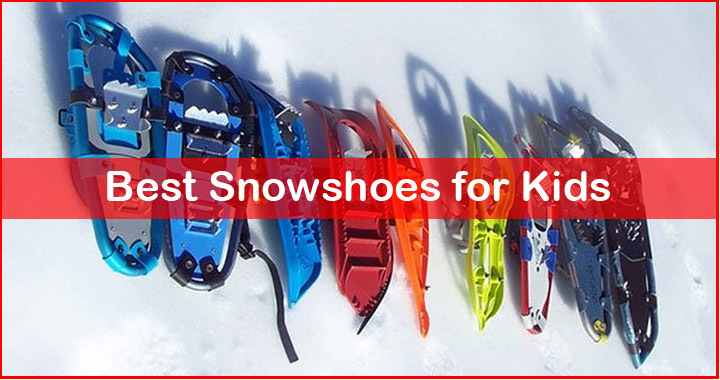 In most cases, kids snowshoes suit shoe size 7-13 (adult size 1-4). Bindings: Make sure the bindings are easy to adjust, can be put on and off quickly, comfortable, and secured. You don’t want your children busy complaining about their snowshoes instead of having fun, do you? Size: The snowshoe size corresponds to its flotation capability as well as its maximum weight load. Generally, the larger it is, the better it’ll keep your child’s feet aloft above the snow. Most snowshoes for kids have a maximum weight load of 90-pound. That includes the kid’s body weight and their backpack. You need to keep in mind your child’s physique too. You don’t want to buy him/ her snowshoes that are too large, making them very difficult to walk. Traction: As you flip the snowshoes, you’ll find a set of toothy devices underneath the snowshoe decks. These are the crampons. They’re designed to provide a traction against the hard packed snow, reducing the risk of getting slipped. We believe all the kids snowshoes listed above have all that it takes to be the perfect ones. They have comfortable bindings and are equipped with adequate traction systems. Jacket: The ideal jacket for snowshoeing is a shell waterproof and windproof jacket. Insulated thick jackets may be warmer but once you hit the trails, they’ll become too hot for your kids. Avoid wearing fleece jacket since snow can turn it wet quickly. Pants: Soft shell pants made of wool or synthetic material should be enough for snowshoe trips of any distance. Make sure you pick out the ones that have water repellent feature. For short distance snowshoeing, insulated ski pants for children could work the same as well but avoid them if you’re going through several fair inclines. Jeans and cotton pants are obviously a no-go. Footwear: The choices are winter boots, hiking boots, and trails shoes. Insulated winter boots are the most convenient of all but make sure they have good ankle flex. As for the last two footwear, always opt for the waterproof models. Gaiters: If your children are wearing hard shell pants or knee-high winter boots, they probably won’t need gaiters. They work as an extra protection seal to keep snow from creeping in the top of the boots, hence, wetting the socks. Base layer: This one is optional. Generally, you will want your kids to wear it if you think the trip day is chillier than usual. Choose the one made of wool and synthetic fabrics that have sweat absorbent feature. Avoid cotton. It may be comfortable but cotton gets cold when it’s wet. Sweater: Sweater and other layering outfits are optional too. We’d recommend to bring one piece or two in a backpack if your adventure is going to be long, hence, requiring a few rest stops. Children’s body can get cold quickly as soon as they stop moving. Accessories: This includes hat, gloves, and socks. Always bring extra pieces for them as they tend to get wet more easily. They don’t have to be made of insulated materials (although they work great on frosty days) but be sure to avoid cotton. Additionally, you may want your kids to bring their own backpack. It doesn’t have to be very big. You can ask your kids to bring their own water bottle, snack, and maybe their sweater and extra gloves too. It’ll give them more sense of adventure. Poles: Poles are completely optional when you’re snowshoeing. Your kids will hardly need them if the trails are mostly flat and groomed. They’re only necessary if the terrain you’re going to cover is a bit challenging. Ski or trekking poles should do a fine job keeping your kids stay sure-footed but big basket/ powder poles are better. Always choose poles with adjustable shafts to accommodate your kids’ growth in the future. There are plenty of ways to make your snowshoeing trip with your kids more exciting and of course safe too. The following list will help you find some ideas. You don’t have to do all of them. After all, it’s your children you’re going to trek with. You know them better than we do. Practice snowshoeing at home. Although snowshoeing is easy, some practice prior to the real trekking won’t hurt. Teach your kids to take on and off their snowshoes by themselves. Practice walking forward and making a U–turn. Remember to always do the practice on grass. Bring some friends. The easiest way to get your child excited about his/ her first snowshoeing trip is by bringing one or two friends. The only catch is you will have to manage more young souls along the way, which may not be too easy. Do a lot of check-ins. You have to keep in mind that you’re hiking with a kid who is maybe too small to understand their own body. You have to be more proactive. Every now and then, ask him/her whether it’s too cold or too warm. Add or subtract layers when necessary. Tell your kids that it’s an adventure. Young snowshoers may not understand this. After a series of long walk, they’ll simply get bored and will ask for a piggyback ride. You should make it clear to your kids at the trailhead that it’s an adventure. You’re going to watch over them all the time but you will not carry them on your back. Bring enough foods for lunch break and extra snacks and water too. This should be pretty obvious. Chewing on snacks can help keep your kids spirit up and give them energy to keep walking. Avoid having hot cocoa because it may lead to sugar rush. Instead, bring warm apple cider in an insulated thermos. Here are some terrific hiking snack ideas and winter specific snack ideas. Plan your route with your kids. You shouldn’t exclude your kids when planning the route. Ask your kids to help you, although in the end it’s you who’ll make the decision. Just show them the map. Teach them how to read it using compass. They’ll feel more responsible with the trip. Avoid ski tracks. In many cross-country ski resorts, the snowshoe trails intersect with ski tracks. You will want to avoid this to prevent any accident. Have a hearty meal before hitting the trails. Snowshoeing takes a lot of energy. You want your kids to stack enough calories before the adventure. Essential accessories: this includes extra gloves, extra socks, and extra hats. Also bring sunscreen, hand sanitizer, and plastic whistle for your kids. Play some games. Playing games is another great way to keep your kids engaged and excited about the journey you’re making. The games don’t have to be complicated. Simple thing like, “Scavenger Hunt” which is making a list of whatever interesting thing your kids find on the way should be fine enough. Here are some more simple trail games from WTA.org and Outdoors.org. Try to tackle rolling hills. If you successfully make the first snowshoeing journey exciting, your kids will definitely ask for more outing. This time around, consider taking them to some rolling hills instead of the usual flat trails. The varying terrain along the way can help keep them engaged. What is the minimum age for a kid to wear snowshoes? We found that Tubbs Snowflake are the simplest snowshoes made for the youngest age group. The manufacturer states that these snowshoes are recommended for kids of three to six years old. However, many parents tell that they can fit a two years old kid just fine. I found my kid to be in between two age groups or weight ranges. Which snowshoes should I choose? In this case, we’d recommend to always go for the larger snowshoes, even if your kid is at the lower end of the age or weight range. The reason is children grows up fast. Choosing larger snowshoes would ensure that the gear will be of use in the long term. An exception, however, is when the said larger snowshoes don’t fit your child’s foot or are simply too big for his/her gaits. Can we take our dog along with us when snowshoeing? Yes, you can. At least, in most cases. Although most national parks have a clear rule to leave your dog at home, plenty of trails and national forest in state and on BLM land permit visitors to bring their dog. Specific leash rules are usually disclosed at the trailhead. Make sure you read them. Still, just to be on the safe side, we suggest that you check the website of the park you want to visit. Don’t forget to have your pooch wear boots too to protect their paws. If it is fall potential you concern about, know that snowshoeing is completely safe. After all, it only involves walking on the trail. You can have your kids use poles if the terrain is kind of unpredictable. Tell them to stay away of cliffs and treewells. Also, avoid ski tracks. If you go with a group of children, make sure there’s an adult in front of and at the back of the line. Have them walk in pair and give each of them a plastic whistle, in case they get lost. For eye protection, what do you recommend? Goggles or sunglasses? It depends on the weather. If you’re going out on snowy day, goggles offer better protection. However, if the weather is bright and sunny, sunglasses are preferable. If you don’t want to buy both for your kids, consider buying sunglasses. You can add the affordable retainer to them so the kids can hang them on their neck when not in use. Now that your kids have got their snowshoes, why don’t you get yours? Check out our top 10 picks for the best snowshoes of 2017.